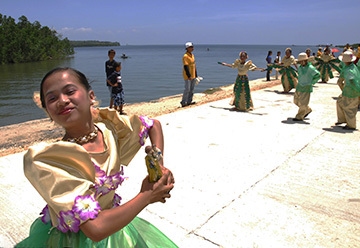 ■ Theme " Coastal Ecosystems and Biodiversity of the Asia Pacific : Achieving SDG14 ". /////////////// Biodiversity studies, including ecology, physiology, behaviour, taxonomy/phylogeny, aquiculture, conservation and management issues, data-bases. The symposium features a special pre-symposium seminar on "Statistical data handling in environmental sciences" by Dr M Yoko-o. ////////////// All types of organisms and coastal environments (marine-brackish-freshwater and adjacent terrestrial systems), integrative approaches, data-handling techniques. Local Organizing Committee headed by Prof Yusli Wardiatno of Bogor Agricultural University. Registration procedure: (1) Pay the appropriate sum using PayPal below, (2) fill in the registration form (download), and (3) send the completed form to the Symposium Secretariat [ bogor2019(at mark)scesap.org ] as email attachment. Mail subject: "registration_your family name", text: "registration : PayPal receipt/transaction ID number". A person different from the applicant can also settle the PayPal bill on his/her behalf by simply putting the applicant's full name in the section 'Add special instructions to the seller' within the bill. A successful payment will generate a PayPal receipt/transaction ID number, which the applicant should supply on the registration form. This means that each applicant will have a unique receipt ID. Oral presentations: PowerPoint, 12min, Posters: A0 (or smaller) size, portrait. All materials to be prepared in English only. A 200-word (max) abstract (Oral) / 120-word (max) abstract (Poster) to be submitted by 31 May 2019. An abstract must have (1) a title (capital letters should not be used except for the 1st letter of the first word of the title, proper names and common abbreviations), (2) author names and affiliations (be brief), and (3) the corresponding author's email address. Make this in MS WORD or WORD-compatible form on A4, margins 30mm on all sides, font: Arial, font size: 10, aligned to the left only. Submit this as an email attachment to: abstract2019(at mark)scesap.org . Subject: oral (or poster), text: 1st author's name. Note that the Symposium Organizers cannot guarantee a slot for oral presentation and some late applicants may be asked to switch from oral to poster presentation, if oral slots are full. In such a case, prospective presenters will be contacted as soon as possible. ■ Works presented at the symposium and submitted thereafter will be published, after peer-reviewing, in the Society's journal "Coastal Ecosystems". Papers which do not meet the standard of CE may alternatively be published in the Bulletin, at the discretion of editors. Submission of works for publication by SCESAP members will incur no cost; non-members must pay 50 USD symposium publication charge (this is a discount; normally, non-members need to pay 80 USD for publication in CE), apart from the registration fees. It is therefore recommended that prospective delegates obtain SCESAP membership before registration. The SCESAP, in collaboration with the AMBL-Kyushu University, offers field courses to students of any nationality (mainly undergraduate level for the spring course and postgraduate level for the summer course, but admission is flexible). SCESAP members will be given priority in case the number of applicants exceeds the capacity under this scheme. 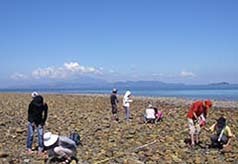 A basic course involving the sampling and classification of marine organisms of diverse taxa from different environments. Mainly undergraduates. An intensive field ecology course involving sampling, observations and surveys, data analysis and presentation. Mainly postgraduates. The SCESAP will issue a certificate to those who have successfully finished the course. In addition, AMBL/Kyushu University may issue credits to participating students. International participants must obtain SCESAP membership before applying. Students themselves are responsible for travel costs to and from the AMBL. There is no travel subsidy available and participants are recommended to obtain an international travel insurance to cover the whole period. The course fee, payable on arrival, is approximately 20,000 JPY including all meals and accommodation (a big bargain in Japan ! ); normally the SCESAP provides a (minimum) 20% subsidy on this in the case of self-funded students. 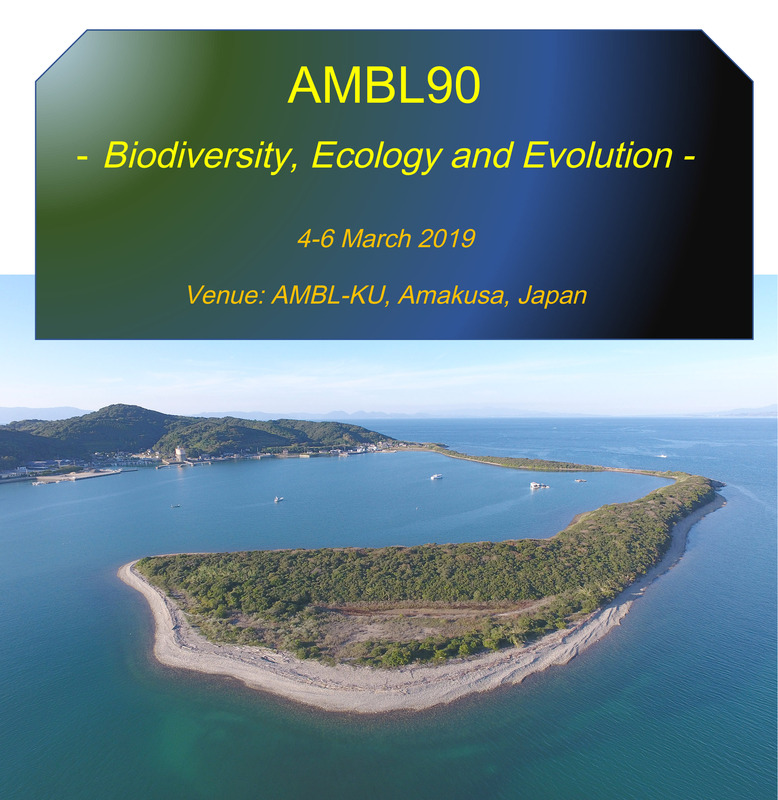 Places are limited in each course (<10), so early registration is essential; Apply with your full CV to Prof M Tokeshi/Dr Arakaki at the AMBL-KU ( tokeshi or arakaki[at mark]ambl-ku.jp ); make sure for which course you are applying. A letter of invitation will be issued for international students who require a visa to enter Japan. Registration will be closed as soon as places are deemed full (deadline: end of January for the spring course, end of June for the summer course). See "Notice to participants". ■ Theme " Biodiversity in Adversity : Asian and Global perspectives ". /////////////// Biodiversity studies, including ecology, physiology, behaviour, taxonomy/phylogeny, aquiculture, conservation and management issues, data-bases. 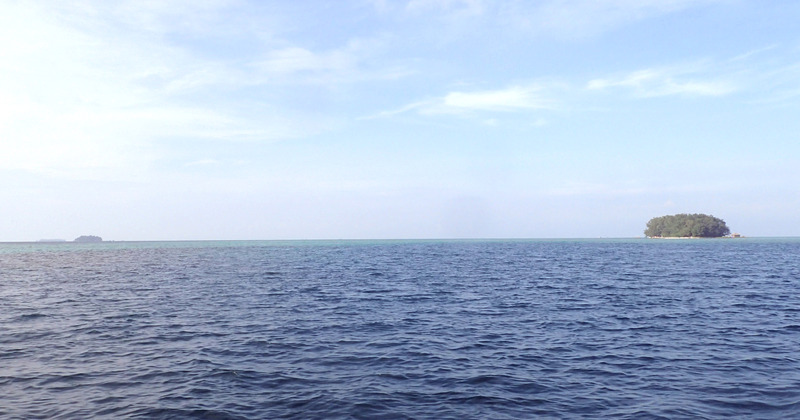 Special sessions include one on "Marine Biodiversity in the South China Sea. On-site payment is possible with USD cash only. Registration procedure: (1) Pay the appropriate sum using PayPal below, (2) fill in the registration form (download), and (3) send the completed form to the Symposium Secretariat [ cebu2017(at mark)scesap.org ] as email attachment. Mail subject: "registration_your family name", text: "registration : PayPal receipt/transaction ID number". Accommodation options: This will be arranged separately. All close to the venue. Prices are approximate. 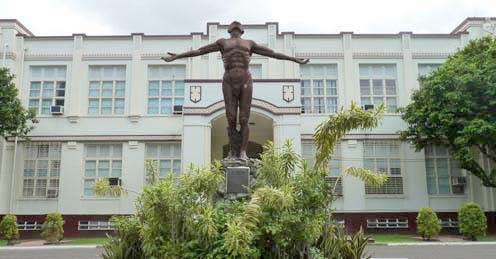 These will be offered on a first-come, first-served basis according to the timing of registration. When full, the next category up will be offered. Early registration is therefore advantageous. Oral presentations: PowerPoint, 12min, Posters: A0 (or smaller) size, portrait. All materials to be prepared in English only. A 200-word (max) abstract (Oral) / 120-word (max) abstract (Poster) to be submitted by 15 September 2017. An abstract must have (1) a title (capital letters should not be used except for the 1st letter of the first word of the title, proper names and common abbreviations), (2) author names and affiliations (be brief), and (3) the corresponding author's email address. Make this in MS WORD or WORD-compatible form on A4, margins 30mm on all sides, font: Arial, font size: 10, aligned to the left only. Submit this as an email attachment to: abstract2017(at mark)scesap.org . Subject: oral (or poster), text: 1st author's name. Note that the Symposium Organizers cannot guarantee a slot for oral presentation and some late applicants may be asked to switch from oral to poster presentation, if oral slots are full. In such a case, prospective presenters will be contacted as soon as possible. 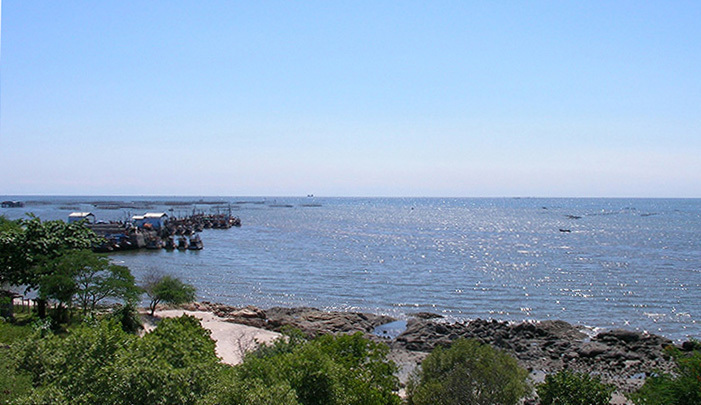 SCESAP International Colloquium: "Connecting marine biodiversity to people"
We are pleased to announce this timely international colloquium in Bogor, Indonesia. 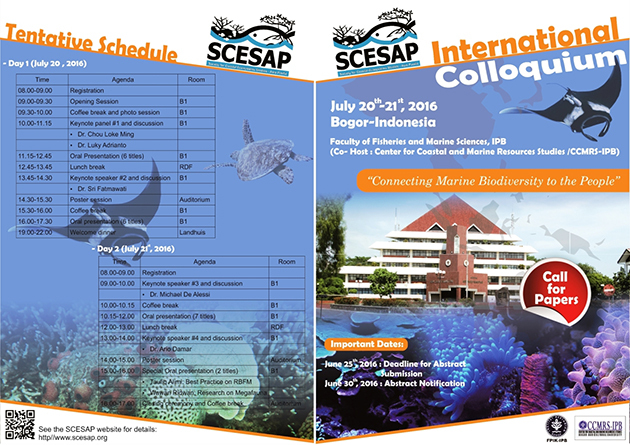 The SCESAP International Colloquium with the theme of "Connecting marine biodiversity to people" will be hosted by the Faculty of Fisheries and Marine Sciences of Bogor Agricultural University and will be held on 20-21 July 2016. 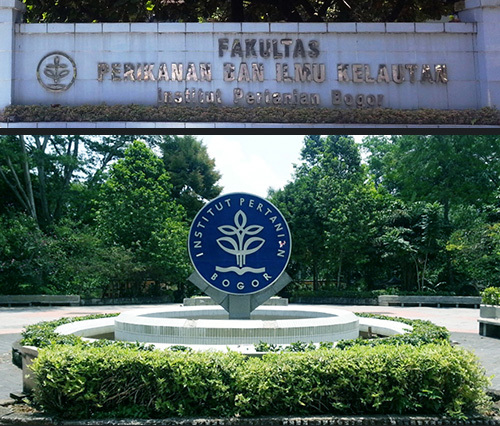 The conference will be held at the Faculty of Fisheries and Marine Sciences IPB Darmaga Campus. Jl. Rasamala, Dramaga, Bogor – West Java, Indonesia. All those interested in coastal/marine sciences and related areas. Academic (researchers/lecturers/students) as well as non-academic (government/industry/NGOs) representatives are welcome. The Colloquium includes plenary as well as general (oral/poster) sessions. Plenary sessions of the conference include 5 keynote talks by: Dr. Luky Adrianto (Faculty of Fisheries and Marine Science, Bogor Agricultural University), Dr. Sri Fatmawati (LEMAR, Universite de Bretagne Occidentale, France), Prof Chou Loke Ming (National University of Singapore), Dr. Chiu Man Ying (Hong Kong Baptist University) and Dr. Michael De Alessi (SAFS, University of Washington). Oral and poster sessions will be broadly organised according to the four selected topics as listed above. However, any topic will be welcome and considered for inclusion. Exhibitions at this conferene will be an ideal platform for technological information exchange and networking among stakeholders (researchers, industry, academia). 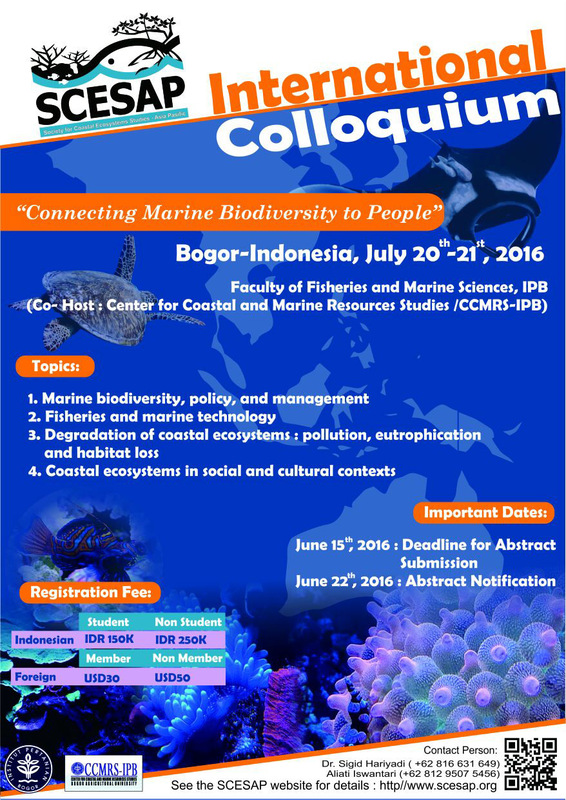 Registration procedure; (a) participants from outside Indonesia: (1) Pay the appropriate sum using PayPal below, (2) fill in the registration form (download), and (3) send the completed form to the Colloquium Secretariat [ bogor2016(at mark)scesap.org ] as email attachment. Mail subject: "registration_your family name", text: "registration : PayPal receipt/transaction ID number". (b) participants from Indonesia: (1) Pay the appropriate registration fee to: Bank BNI, Cabang Kampus IPB Dramaga Bogor, (account name)Rekening Rektor IPB c/q KS-FPIK, No 3889960 , (2) fill in the registration form (download), (3) send the completed form and a copy of payment receipt to the Colloquium Secretariat [ bogor2016(at mark)scesap.org ] as email attachment. Mail subject: "registration_your family name", text: "registration : Indonesia". (4) Indonesian students who are not yet SCESAP members can avail themselves of the special membership rate (JPY4000 instead of normal JPY6000) that is offered FOR A LIMITED PERIOD ONLY for this colloquium (valid until 5 August, below). All prospective presenters need to obtain SCESAP membership. For ordinary, non-student membership (currently JPY8000), go to our membership site. This will be separately arranged by the Secretariat. Oral presentations: PowerPoint, 13min, Posters: A0 (or smaller) size, portrait. All materials to be prepared in English only. A 200-word (max) abstract (Oral) / 120-word (max) abstract (Poster) to be submitted by 25 June 2016 (see below). An abstract must have (1) a title (capitalise the first letter of the first word only, exc proper names and common abbreviations), (2) author names and affiliations (be brief), and (3) corresponding author's email address. Make this in MS WORD or WORD-compatible form on A4, margins 30mm on all sides, font: Arial, font size: 10, aligned to the left only. Submit this as email attachment to: abstract2016(at mark)scesap.org . Subject: oral (or poster), text: 1st author's name. Note that the Symposium Organizers cannot guarantee a slot for oral presentation and some late applicants may be asked to switch from oral to poster presentation, if oral slots are full. In such a case, prospective presenters will be contacted as soon as possible. Programme (the latest version, 1 Jul) is here. 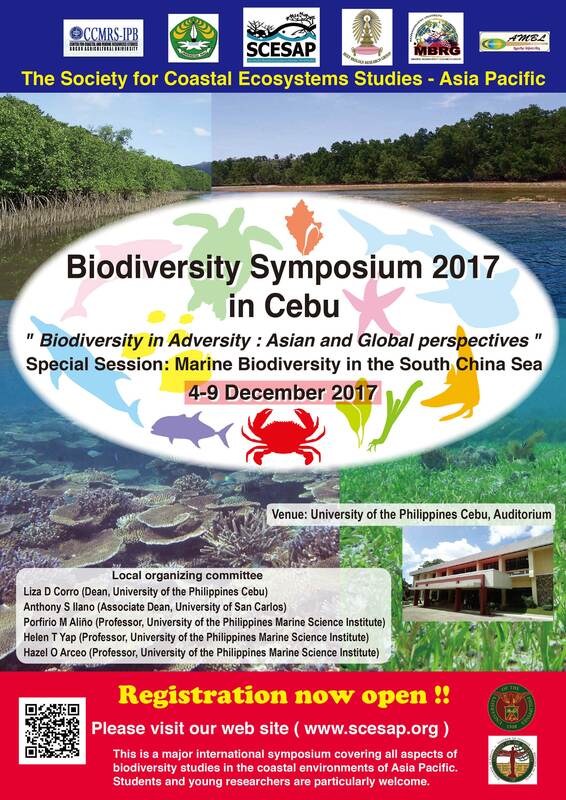 This is a major international symposium covering all aspects of biodiversity studies in the coastal environments of Asia. Students and young researchers are particularly welcome. The symposium is generously supported by the Society and various sponsors, making it a real value for money. 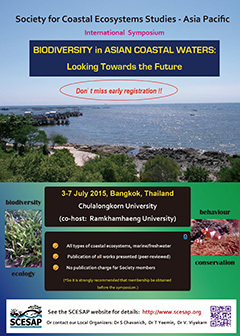 ■ Theme " Biodiversity in Asian Coastal Waters : Looking Towards the Future ". See poster. /////////////// Biodiversity studies, including ecology, physiology, behaviour, taxonomy/phylogeny, aquiculture, conservation and management issues, data-bases. ■ Works presented at the symposium and submitted thereafter will be published, after peer-reviewing, in the Society's journal "Coastal Ecosystems". Papers which do not meet the standard of CE may alternatively be published in a special symposium volume of the Bulletin, at the discretion of editors. Submission of works for publication by SCESAP members will incur no cost; non-members must pay 50 USD symposium publication charge (this is a discount; normally, non-members need to pay 80 USD for publication in CE), apart from the registration fees. It is therefore recommended that prospective delegates obtain SCESAP membership before registration. Registration fees (higher rates for delegates from certain countries** ; designated as High category) ------------- This includes all lunches and dinners during the symposium. **Brunei, Hong Kong, Israel, Japan, Korea, Kuwait, Qatar, Singapore, Taiwan, UAE, EU countries, USA, Canada, Oceania (exc. 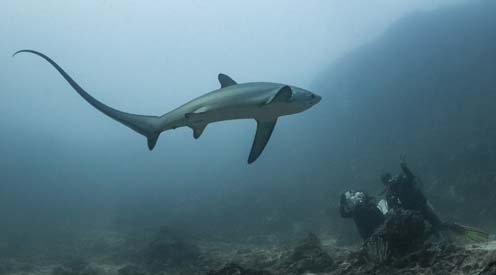 S.Pacific nations), S.Africa. NOTE: Online registration facility has been extended beyond the original deadline of 30 April; Please note that, once paid, registration fees are non-refundable under all circumstances. Registration procedure: (1) Pay the appropriate sum using PayPal above, (2) fill in the registration form (download), and (3) send the completed form to the Symposium Secretariat [ sympo2015(at mark)scesap.org ] as email attachment. Mail subject: "registration_your family name", text: "registration : PayPal receipt/transaction ID number". Accommodation options (approximate price per night per person): This will be arranged separately. All close to the venue. Oral presentations: PowerPoint, 13min, Posters: A0 (or smaller) size, portrait. All materials to be prepared in English only. A 200-word (max) abstract (Oral) / 120-word (max) abstract (Poster) to be submitted by 15 April 2015 (see below). An abstract must have (1) a title (capitalise the first letter of the first word only, exc proper names and common abbreviations), (2) author names and affiliations (be brief), and (3) corresponding author's email address. Make this in MS WORD or WORD-compatible form on A4, margins 30mm on all sides, font: Arial, font size: 10, aligned to the left only. Submit this as email attachment to: abstract2015(at mark)scesap.org . Subject: oral (or poster), text: 1st author's name. Note that the Colloquium Organizers cannot guarantee a slot for oral presentation and some late applicants may be asked to switch from oral to poster presentation, if oral slots are full. In such a case, prospective presenters will be contacted as soon as possible. New Note Added on 11 June: Submission officially closed; for late submission, contact the Secretariat, Dr Arakaki, arakaki(at)ambl-ku.jp). Check this site regularly to obtain the latest information. All photographs/images (except sponsor logos) on the SCESAP website (www.scesap.org) are the properties of the SCESAP HQ. © 2013 SCESAP HQ. All Rights Reserved.